And I dare anyone to challenge it. Even her. Loyalty and trust is engrained in our blood. The Ravage Motorcycle Club’s ties have become stronger than ever. Yet, some dare to try. The biggest mistake my enemies can make is to assume Rylynn is my weakness. Instead, she has made me stronger, harder, and more determined to protect what is mine. Friend or foe, I will never let another person get between us. In the end, nothing can keep us apart. What a beauty! The final book in Crow and Rylynn's trilogy, strap in for the wildest ride of your life. Ryan has managed to create a story that is so intriguing and gripping that you will be glued to you e-reader until you are finished! When you reach the end, even though you will be totally suffering from a book hangover, you will be screaming for more, More, MORE! So much happens in this story! If you thought book 1 and 2 were jammed packed then just wait till you get into book 3. 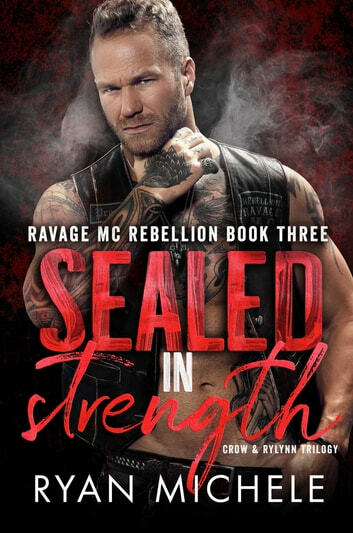 I just loved the title, Sealed in Strength, Crow and Rylynn have not had an easy go of it so far, and things do not get easier for them. The strength of their bond is tested to the max. Crow has his plate full with club business that is crossing over into his personal life. Rylynn is trying to cement her new position in life and to show Crow that she can make him proud of her. Rylynn is everything a book heroine should be. She is smart, tough, mature, strong willed, independent, knows her own mind and I have a total crush. Also being the daughter to my favourite Ravage member really helps. She is so much like her Dad it is scary! I love it! Crow and Rylynn together is just perfection! They have this unspoken bond that transcends the ordinary and catapults them into the realm of extraordinary. They know pain, can feel each other's, it is what connects them, it pulses between them and forever alters them. A tremendous trilogy filled with everything Ravage! Bring on the Rebellion! I knew that this was going to be epic, and I was RIGHT!! When I found out that the author had made these character’s story into a trilogy, I was unsure how that was going to go. But as the stories continued, they became better than the last. There is so much involved with each one that there was no way that it could have been one book, and I am happy with that. There is everything in this last one. We see just how strong Rynlynn is and we see just how far Crow is willing to go for her. There is danger and there is something that made me very happy (even if a little violent). Overall, epic ending to the this trilogy! Happy reading! What a great way to start the New Year. Absolutely love all things Ravage. Crow and Rylynn’s will always be one of my favorites. This can’t be the end we hear from them or what happens next ! Crow is definitely a man to swoon over and Rylynn would’ve any gal’s dream of a best friend. One of the best series I have ever read. Can’t wait to see what else Ryan Michele has in store for us with more Ravage tales.